Reporting for Microsoft Dynamics | Business intelligence for Microsoft Dynamics AX & NAV | BI4Dynamics – run your entire business through one fully integrated Business Intelligence solution. Analyzing your data is not a luxury, it’s a necessity. BI4Dynamics is a risk-free Data Warehouse Automation BI solution. Built specifically for Microsoft Dynamics D365(AX)/ BC(NAV). Everything is already developed to give you meaningful results instantly. Any change to existing or new functionality is just one click away. 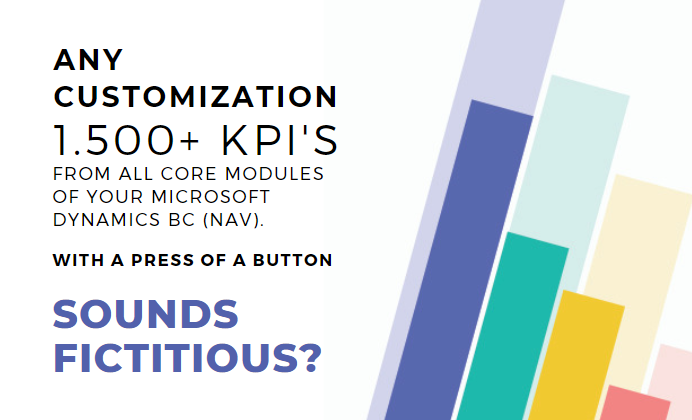 Microsoft Dynamics ERP has complex structures and customizations may results in never-ending BI project, even with Power BI. Managing larger data and more complex models are known Power BI issue. Why compromise performance or features? This is the most important release so far. We are releasing DWA (Data Warehouse Automation) edition that has the same content(1.500+ KPI’s) as STD (standard) edition that we developed over the years by adding SQL code manually. Any change to existing or new functionality is just one click away. Data Warehouse provides a single analysis repository for all data sources across your organization. Data Warehouse supports larger sets of data – millions of rows or terabytes of data is business as usual. Data warehouse enables quickly and efficiently analysis without sacrificing any feature as with Power BI. Snapshots of the data enable additional analysis of historical data that would otherwise not be retained. Data Warehouse Automation tools are Data Warehouse solutions where development cycles are fully automated (code is generated automatically). Data Warehouse Automation process makes Data Warehouse leaner, more flexible and less expensive thus improving productivity, overall quality and reducing cost. Using BI4Dynamics Data Warehouse Automation an IT savvy person can deliver a full data warehouse with a speed of delivery and customization possibilities unseen in the industry. Finish standard part of BI project in 1 day! BI4Dynamics is developed especially for Microsoft Dynamics and is ready to give you meaningful results in a couple of clicks. For a limited time, we are offering a full Onboarding Experience at NO CHARGE. Experience what Data Warehouse Automation solution can deliver out of your Microsoft Dynamics data RISK FREE. Want to know your analyzing possibilities? Need more information? You can unsubscribe or change preferences at any time.